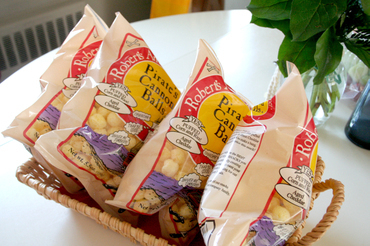 pirate grub: what do pirates eat? grog, lemons, barnacle stew? well it was something more like quinoa salad and pizza... (we did have some flatbread crackers from trader joe's that passed as hardtack). for the cake i used the same recipe that i've used for each of her birthdays - a yellow lemon zest cake recipe from an old martha stewart kids magazine. treasure hunt: after lunch we rounded up the tiny eye-patched crew for a treasure hunt. papa took on the roll of "captain" and led them around the yard, stopping to refer to the map along the way, until they found the hidden treasure chest. for the chest we hinged together two old wooden wine boxes and filled it with the treasures. (now that the party is over i've got my eye on these boxes for a possible cilantro garden.) 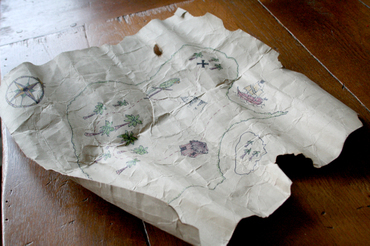 anyway, the plan was to just go treasure hunting one time. the kids had so much fun they asked to do it again and again and i think they went on about 4 or 5 treasure hunts. the loot: we had a lot of ideas for the pirate loot. and once we got the ideas it was hard to forget about them and not create them. so we have lots of treasure crafting going on here. 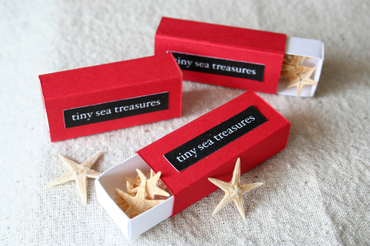 first, out of white and red cardstock we made small matchbook-like boxes and filled them with starfish. kind of fun for them to discover these tiny sea creatures. 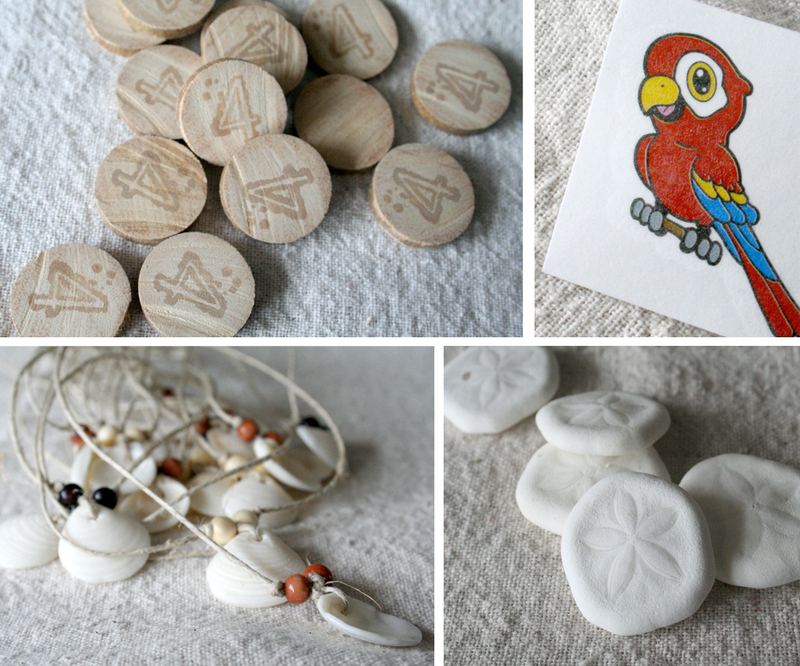 another project was making natural pirate-island-like jewelry. we used some extra seashells that i had picked up and drilled them with holes so they could be strung onto some hemptwine for simple necklaces. and then there were the coins... chuck sawed up an old broom handle into discs and then we stamped them with the #4. what else... sandollars, parrot tattoos... we may have gone a little overboard in the loot department, but these were the projects that were the most fun for us i think, and i'm sure that the little party goers didn't mind. 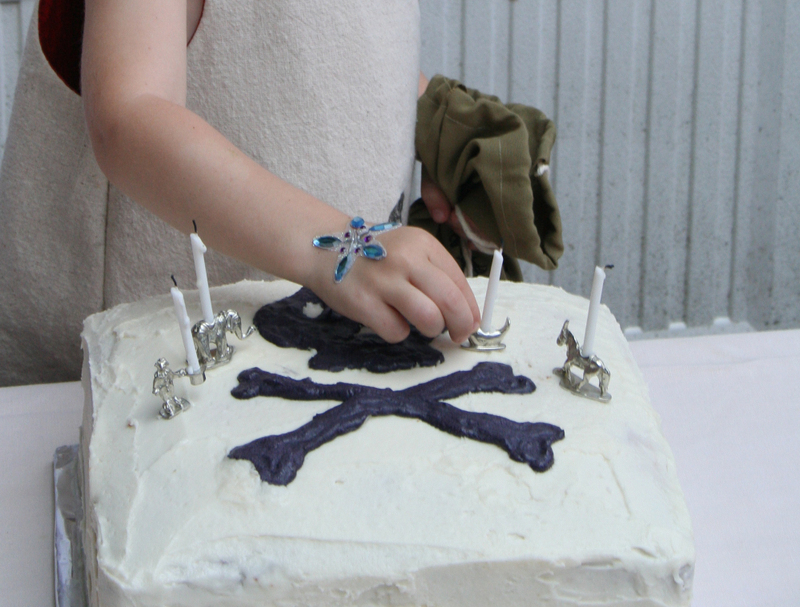 i think, actually i know, that the best thing of all was the simple fact that the sun was shining and the kids were able to run around and celebrate together outside, and of course blow out a few candles... the rest of it - all the flags, treasures, party outfits, etc... well, they were just icing on the cake.